What is home? 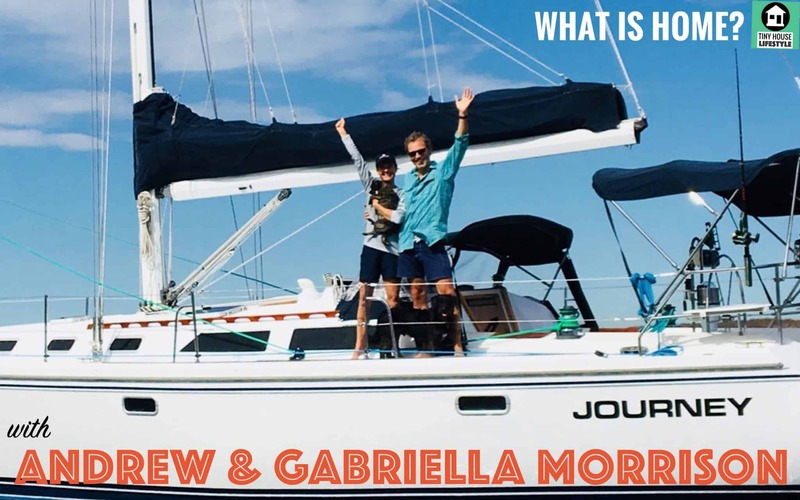 My guests Andrew and Gabriella Morrison tried the 2200sf American Dream only to realize that they were the happiest and most available to their children when they were living with the least. Aside from being awesome people, Andrew and Gabriella are some of the most faces in the tiny house movement. They created a very popular how to build dvd set, designed the hOMe which has been widely influential on the shape and layout of tiny houses on wheels, and speak at many of the most important tiny house events around the country. Think of this interview as a primer of how Andrew and Gabriella view life, family, and home. I think you'll come away feeling inspired and ready to embrace change in your life! Andrew and Gabriella came across the tiny house movement at a pivotal moment in their lives. They had finally purchased their dream home, but after 6 months of living in it with there 9 and 13 year old children, they noticed that their family dynamic was falling apart. Baffled and distressed, they felt that their tight-knit family structure was eroding, scattered throughout their new larger home. Around the same time, they serendipitously received an email from Kent Griswold from The Tiny House Blog and Gabriella instantly fell in love with the concept of tiny living. Andrew wasn't completely on board at first, but walking around his house looking all the empty rooms, he began to notice how underutilized it all was. After crunching the numbers on heating and cooling, they realized that there was a real dollar amount associated with their larger lifestyle. With their increased footprint came larger bills and less ability to have meaningful experiences with their children. Within 6 months, they got rid of the house and 90% of their worldly belongings. At the same time, their son decided that he wanted to go to boarding school to play ice hockey. Now homeless, and with one of their kids away, they saw an opportunity to have an adventure with their daughter who was fascinated by the Sea of Cortez. So they bought a minivan, popup camper, and headed out into the unknown land of Baja Mexico. The transition from the typical western culture was a painful detox process and they almost gave up and turned around. But after about a month, the cloud lifted and the Morrisons lived happily off the grid for 5 months. The experience brought them closer to their daughter and helped cement the decision to adopt the tiny house lifestyle. During the construction of their tiny house on wheels Andrew and Gabriella filmed the process, which ultimately became their popular four-DVD construction set. Andrew is a professional builder and had already been teaching straw bale construction for years. He saw a lot of potential mistakes and problems in the way that amateurs were building their tiny homes, and wanted to provide an educational resource from the perspective of a pro. In addition to hOMe, as their kids grew older, they each had a sleeping cabin on the property detached from the tiny house. But after many years of tiny house living, they were ready for another adventure. Once both of their kids were in college, it felt like time for a change. They realized that they could trade one passion and vision for another one. This meant trading the tiny house lifestyle for the boaters lifestyle. Andrew and Gabriella's new “tiny home” is a 42-foot Catalina with three births and two heads. Andrew jokes that they can now stand up in the bedroom, so the sailboat was actually an upgrade in terms of size. While it may not be their home forever, that's okay. With the Morrisons, it's all about the experience and the adventure.